Jere Grice/Press-Tribune Airline's Chase Rivers is keeping busy this summer playing baseball and preparing for the football season. 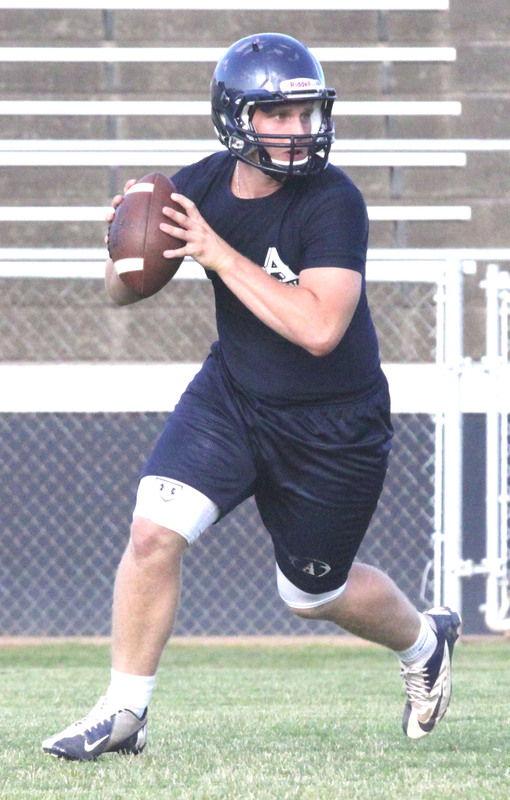 Between playing baseball and preparing for the upcoming football season, Airline’s Chase Rivers doesn’t have time for much else this summer. But that’s fine by him. In fact, juggling both sports is not something that he finds difficult to do. “It’s not tough when you’re doing something you love,” he said. Rivers, who will be a senior this fall, is the heir apparent to Hayden Hildebrand at quarterback. He was also a standout first baseman on the Vikings’ 2013 playoff team. Monday — Football at 7:30 a.m. and a Dixie Majors baseball game at 8 p.m.
Tuesday — Football at 7:30 a.m., a 7-on-7 football game at 6 and a Dixie game at 8. Thursday — Football at 7:30 a.m. and a baseball game at 8. He’s also spent one weekend this month playing for the Airline Prospects baseball travel team, which is in a tournament at Louisiana-Lafayette this weekend. It’s actually not an unusual schedule for Rivers, who has been spending his summers doing the same thing since he reached high school. Rivers spent the last two seasons backing up and learning from Hildebrand, who will go down as one of the best quarterbacks in the history of Bossier Parish football. Rivers said he doesn’t really feel any pressure following in Hildebrand’s footsteps. “You can’t really worry about it and what other people think about you,” he said. Not only will Airline have a new starting quarterback in Rivers this fall, the Vikings have a whole new set of receivers. Rivers has worked with them in JV ball the last couple of years, but he said playing 7-on-7 is helping them get to know each other better. Rivers is determined to be ready when the Vikings open the season Sept. 6 against Bossier. Airline head coach Bo Meeks said Rivers has made steady progress during the offseason. Accuracy down the field, arm strength and a quick release are important for a quarterback to master in Airline’s spread offense. Rivers has been working with Meeks to improve on all three. “Just being more decisive and confident in his ability because he has the ability to do the job we need done,” Meeks said. Meeks said Rivers also has the right attitude when it comes to replacing Hildebrand. Airline’s Chase Rivers looks for a receiver during a 7-on7 game against Benton.